As a celebrity, Amy was photographed and photographed! For this exhibition we have drawn on a wide range of sources, both private and public, from the family archives to museum collections, to tell Amy’s remarkable story through contemporary photographs. Many of the images have not been seen before and capture Amy as a child and a student, at home with her family, on holiday, horse riding and motor rallying as well as making celebrity appearances on flights across the world. These often beautiful and moving pictures also give a rare glimpse of a past era and a rapidly changing world, spanning Amy’s 37 eventful years. …and at other pop-up locations throughout the city. Admission: Adults £2, Concessions £1.60, Children under 16 free. 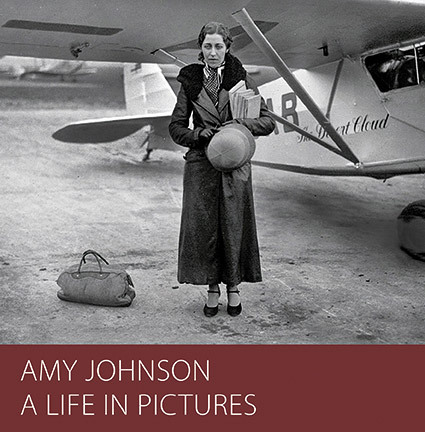 Amy Johnson – A Life in Pictures will be published as a hardback large format photo book to coincide with the exhibition. It will include all the exhibition photos and additional pictures, creating a beautiful and lasting tribute to Amy. Sale price £18. Available at exhibition venues, Festival Shop in Zebedee’s Yard, and Waterstones, Jameson Street, Hull. Pre-order your copy at the reduced price of £15 by sending an email to sales@amyjohnsonfestival.co.uk.